← And so it goes on – yet another fishing tackle problem. It is surprising how often we’re out on a rescue mission, with our minds focused on the task in hand, when we receive another call for help from some far distant place. So it was on 30th. January when we were dealing with a double rescue in The Vale of Glamorgan; Sid – that’s Dad – is a total beast when it comes the time for the kids to leave home – the words territorial dispute hardly do justice to what actually happens … but just for now, we won’t go there …! Anyway we had successfully rescued the last two juveniles (that’s another story), and had been offered a cuppa by way of recovery from our exertions, and yes – no prizes for guessing – the phone rang. HQ wished to advise us a woman in Monmouth was concerned about a swan which had beached on the banks of the River Wye, and had hardly moved all day. So, very conscious daylight is still very limited even in late January, we made our apologies and left, knowing that we had to get our two rescue birds settled in before driving on to Monmouth. The drive up the A449 and A40 was dominated by concerns as to what we might find; don’t forget we’ve just come through one of the wettest winters ever, and so the river was going to be in spate, or, put it another way, very unfriendly. When we arrived, there really wasn’t much light left, but finding the swan was not a problem. Over the years, we have been regular visitors to the Monmouth Rowing Club boating stage. We parked well up towards the bridge on the grass, and walked up to the bridge. It was a spot we remembered well from another rescue some years ago when we retrieved a very seriously ‘tackled’ – triple barbed hook and lure – from the bottom of a seriously steep bank a few short yards from the bridge. The difference was, that, way back then, the river was much more like its ‘summertime self’. Not now; it was an absolute raging torrent rushing through the bridge arches. The bank cuts back and ends against a vertical wall of masonry which I guess could be described as part of the bridge abutment on top of which is the pavement and the A40 trunk road. A little back from the wall, and at the bottom of the bank is a tiny flattish area; it would be disrespectful to beaches to so describe it, but this was where our swan was resting. 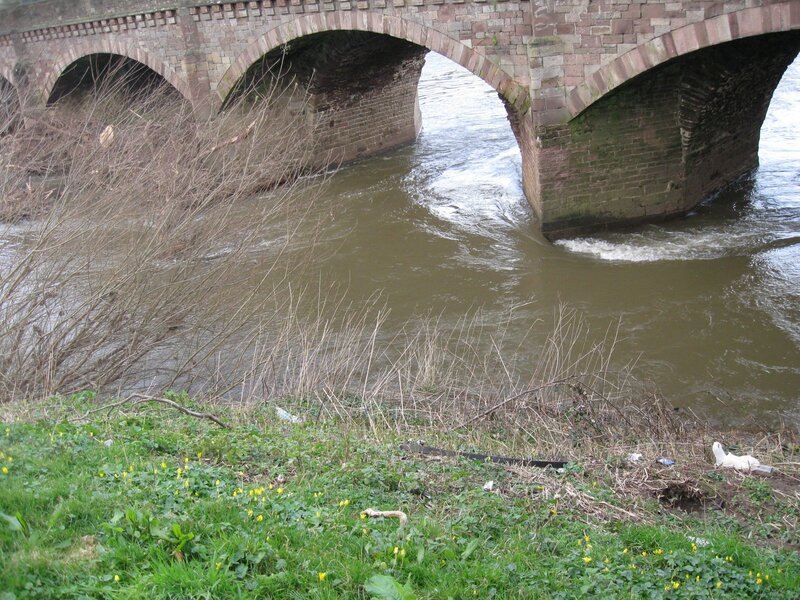 This picture was taken a month later, when the river was even angrier than it was the night of the rescue. This is the way the river looked from the top of the bank where the swan was resting. Well, the prospects were not great, but we had to give it a try. The equipment we used comprised a length of good quality rope to secure the idiot going down the bank to the railings which are clearly visible in the first of out photographs, a swan hook with an extension very firmly secured and the usual swan wrap. Getting down the bank was, surprisingly, not too difficult despite early growth/emerging nettles! 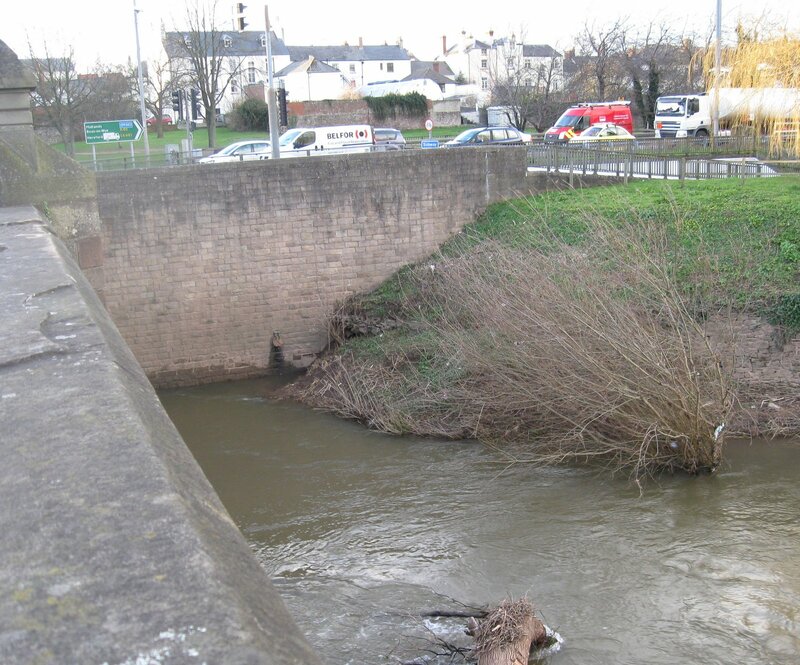 The first attempt with the swan hook failed – the swan took to the water and was swirled around in eddies just short of the nearest bridge arch. Quite clearly however, as a result of whatever had happened to it, it was exhausted and needed to be back on terra firma. Thankfully for us, the swan obliged, and after some agonising moments I managed to secure the hook around the swan’s neck and began very slowly and carefully to bring her towards me … and basically that’s it … it’s at this stage there tends to be a feeling of anti-climax, but the important thing was that we were then in a position to establish just what the problem was and to formulate a plan. By this stage a few local residents had gathered, interested in what was going on. In conversation with one couple, it emerged there had been a confrontation between this bird and a dog, and so it turned out – close to the base of the neck on the right hand side was a very deep and extensive wound – for sure, a dog bite. Armed with this knowledge, our next move, having secured antibiotics and pain relief from our vet, was already prescribed – to the only place such a badly injured swan could be taken for treatment – The National Swan Sanctuary at Shepperton; that accounted for the following day. It has to be admitted this was amongst the worst dog bites seen at Shepperton, and the fact the prognosis was not so good accounted for the all-round gloomy faces as we came away. Despite this, the swan came through the next couple of days, and we were starting to feel a little more optimistic. We should have known better – the struggle proved too much and she died in the early hours of the third day. It’s so very sad – all that effort brought about by some unthinking/uncaring dog owner who must have known the attack took place. The only consolation we have is that we know we couldn’t have done anything more. That’s the way it goes sometimes – fortunately, not too often.